Plácido Enrique Polanco (/ˈplɑːsɪdoʊ ɛnˈriːkeɪ poʊˈlɑːŋkoʊ/; born October 10, 1975) is a Dominican-American former professional baseball player. He played in Major League Baseball (MLB) for the St. Louis Cardinals, Philadelphia Phillies, Detroit Tigers and Miami Marlins. He was a second baseman, third baseman and shortstop. He was twice voted to start in Major League Baseball All-Star Games: in 2007, and again in 2011. In a July 9, 2008, ceremony at Comerica Park prior to the Tigers–Indians game, Polanco received his U.S. citizenship, along with 99 other people. He wore his Tigers uniform for the ceremony. Polanco was drafted on June 2, 1994, by the St. Louis Cardinals in the 19th round of the 1994 Major League Baseball Draft. In 1996, he led the Florida State League with 157 hits and 137 games played while playing with Single-A St. Petersburg. Polanco was promoted to the major leagues in 1998. His first major league hit was a single off Cincinnati Reds starting pitcher Brett Tomko on July 5, 1998. Earning the starting third base job in 2001, his low strikeout/walk ratio and extra base hits numbers established Polanco as a contact hitter. On July 29, 2002, Polanco, Mike Timlin, and Bud Smith were acquired by the Phillies for Scott Rolen, Doug Nickle, and cash. Polanco was shifted to second base as David Bell was signed from free agency to play third base. He began to develop power while playing for the Phillies as he hit 14 and 17 home runs in the following two years, compared with just nine in 2002. 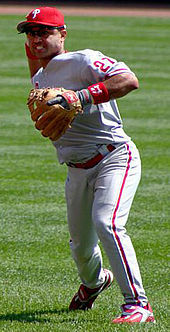 The Phillies traded him to the Detroit Tigers in a June 2005 in a trade for veteran right-hander Ugueth Urbina and infielder Ramón Martínez, allowing the Phillies to play Chase Utley every day at second base. Polanco finished the 2005 season batting .338 with the Tigers, and also having a career year with regards to OPS, finishing the season at .847. In addition, he led the majors in lowest strikeout percentage (5.0%) for the season. Polanco was a key player in the 2006 American League Division Series and 2006 American League Championship Series (ALCS) for the Tigers, being named Most Valuable Player of the ALCS. However, he did not record a single hit in the 2006 World Series, in which the Tigers lost to the Cardinals in five games. In 2007, Polanco set a new major-league record for second basemen by playing in his 144th consecutive errorless game on August 13, in a 7–2 loss to the Oakland Athletics. Curt Flood currently holds the record for consecutive errorless games with 226, but he played center field. Polanco appeared to have his streak snapped at 147 games when he was charged with an error in the first inning of the August 24 game vs. the New York Yankees. However, the next day, after conferring with the umpiring crew, the official scorer determined the error was instead charged to first baseman Marcus Thames. This extended the streak to 149 games. Polanco also broke the record for consecutive chances without an error by a second baseman on July 31. He passed Luis Castillo's mark of 647. Polanco finished the 2007 season without making an error, thereby becoming the first everyday second baseman in MLB history to play an entire season without committing an error. This in addition to contributing to 101 double plays, earned Polanco his first Gold Glove Award. In addition to his fielding feats, Polanco batted a career-high .341 in 2007, and reached a career high in hits with 200. He also had the lowest strikeout percentage in the major leagues (5.1%). For his efforts, he was given the Silver Slugger Award at second base. He was voted by the fans to start in the 2007 Major League Baseball All-Star Game, his first one. At the end of the season, he was voted by the fans as the 2007 MLB "This Year in Baseball Awards" Defensive Player of the Year. Polanco won another Gold Glove Award in 2009. After declaring free agency, Polanco signed a three-year contract for $18 million to return to the Phillies, with a mutual option for a fourth year. He was signed with the Phillies to replace Pedro Feliz at third base. Plácido Polanco fielding 3rd base during a 2011 game vs. the Pittsburgh Pirates. In 2011, Polanco was elected by fan balloting to be the starting third baseman in the All-Star game. He was unable to play in the All-Star game due to an injury, and Scott Rolen replaced him in the starting lineup. At the conclusion of the 2011 season, Polanco received his third Gold Glove, making him only the second baseball player in history to receive the award at more than one position (the other being Darin Erstad). On May 14, 2012, Polanco reached the 2,000 hit mark with an eighth-inning home run off David Carpenter of the Houston Astros. On October 29, the Phillies elected to decline their half of a $5.5MM mutual option, instead electing to pay Polanco a $1MM buyout. On December 20, 2012, the Miami Marlins and Polanco agreed to a one-year contract worth $2.75 million, making him the second-highest paid player on the team. The Marlins did not re-sign Polanco after the 2013 season and he was unable to find a contract in free agency for the 2014 season. In March 2015, he claimed to be "90 percent" retired but remained open to the possibility of returning to playing or launching a coaching career under the right circumstances. On August 14, 2016, Polanco officially retired with the Phillies. Polanco was eligible to be elected into the Hall of Fame in 2019, but received less than 5% of the vote and became ineligible for the 2020 ballot. Polanco and wife Lily have a daughter, Aide Rose, and a son, Ishmael. He is a close friend of former teammate and current Angels first baseman Albert Pujols, who is godfather to Polanco's son Ishmael. During the 2008 season, while with the Detroit Tigers, he became a naturalized American citizen, taking the oath of citizenship at Comerica Park prior to a game against the Cleveland Indians. ^ John Lowe (July 10, 2008). "Polanco becomes U.S. citizen before Wednesday night's game". freep.com. Archived from the original on May 5, 2014. Retrieved July 10, 2008. ^ Cardinals' Media Relations, ed. (2001). St. Louis Cardinals 2001 Media Guide. Hadler Printing Company. pp. A178–A179. ^ "Notes: Polanco sets errorless mark". MLB.com. July 31, 2007. ^ "2007 Detroit Tigers Batting, Pitching, & Fielding Statistics". Baseball-Reference.com. Retrieved 22 February 2013. ^ "Baseball Leaderboard". Fan Graphs. Retrieved October 5, 2011. ^ Beck, Jason (December 3, 2009). "Tigers' Polanco nabs Gold Glove honors". MLB.com. Archived from the original on November 16, 2009. Retrieved December 6, 2009. ^ Zolecki, Todd (December 3, 2009). "Polanco happy to be back in Philadelphia". MLB.com. Retrieved December 6, 2009. ^ Ladson, Bill (November 2, 2011). "Polanco's Gold Glove puts him in elite company". MLB. Retrieved 2011-11-05. ^ Adams, Steve (October 29, 2012). "Phillies Decline Placido Polanco's Option". MLB Trade Rumors. ^ Cwik, Chris (December 20, 2012). "Marlins agree to sign Placido Polanco". CBSSports.com. Retrieved December 20, 2012. ^ Parent, John J. "Marlins Sign an Actual Major League Player". Call to the Pen. Retrieved 24 December 2012. ^ Adams, Steve (March 4, 2015). "Placido Polanco "90 Percent" Retired, Open To Coaching". MLB Trade Rumors. Retrieved 8 May 2015. Wikimedia Commons has media related to Plácido Polanco. This page was last edited on 11 April 2019, at 03:56 (UTC).